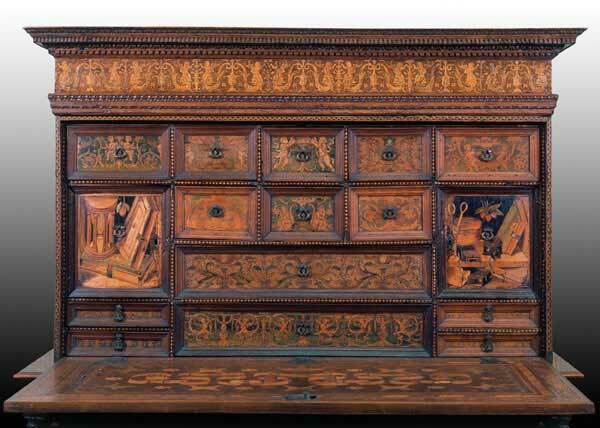 The “Plus Oultra” writing cabinet of Charles V on display at the Victoria and Albert Museum of London is an intarsia piece made by Italian craftsmen ca. 1532. This article examines the iconographic programme of the cabinet as an expression of the universal Christian empire of Charles V and the sacred imperialism of the Spanish Austrias. This programme is revealed in three scenes depicting the story of Gideon that decorate the outside of the cabinet fall front: the revelation of the angel to Gideon and the woollen fleece in allusion to the Order of the Golden Fleece of which Charles V was the grand master, the selection of the three hundred men, and the battle against the Midianites. These scenes are complemented by medallion heads of Roman emperors to portray Charles V as legitimate successor to the Ancient Roman Empire. The inside of the fall front is emblazoned with the emblems of Charles V: the Pillars of Hercules, the ‘Plus Ultra’ motto, Saint Andrew’s crosses and laurel motifs, while the allegorical figures of Temperance and Justice adorning the sides of the cabinet symbolise the virtues of a good governor. 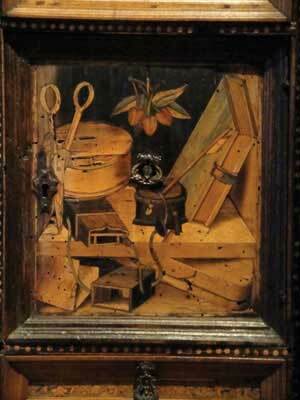 The fall front opens to reveal a set of drawers and doors decorated with one of the earliest examples of the vanitas: objects alluding to the fleeting nature of life and the pursuit of wisdom. From a stylistic standpoint, the scenes and decorative motifs of the cabinet suggest that it may have been made in the workshop of the Dominican friar Damiano da Bergamo which Charles V visited in 1529. Marquetry – known as intarsia in the 15th century – was a technique that was widely used in Italy to decorate a broad range of furniture. The technique, which was later imported to Germany (Aguiló 2009: 15-63), consists of inlaying coloured or stained veneers of different types of wood to create pictorial compositions. Many examples of intarsia are still preserved in choir stalls, seats, pulpits, lecterns, small chests and wall panels, attesting to the widespread use of this decorative technique. Cabinets are one of the most elaborate examples of furniture of this type due to their use as personal objects of great luxury and ostentation. This paper examines one of the oldest and most unique cabinets remaining in Europe, the Plus Oultra writing cabinet, currently on display at the Victoria and Albert Museum of London. This singular piece demonstrates the importance of research into art furniture; an art form that has not been given the full attention it merits. The Plus Oultra writing cabinet has previously been examined in catalogues. The most complete study and only monographic work published to date is that of W.A. Thorpe (The Plus Oultra cabinet at South Kensington, 1951), who gave a detailed account of the images depicted on the cabinet. This article first aims to demonstrate that the iconographic programme of the Plus Oultra cabinet was devised to glorify the sacred imperialism of the Austro-Spanish Holy Roman Empire (figure 1). Following a comparative analysis of works dating from the same period and new data taken from recent historiography, the paper then attributes the possible authorship of the cabinet to Fra Damiano da Bergamo's workshop, as well as other craftsmen who executed the scenes and decorative motifs. Fig. 1: Front of the cabinet. © Victoria and Albert Museum, London. One of the most outstanding and earliest cabinets to survive in Europe, this piece is known as the Plus Oultra cabinet owing to the Pillars of Hercules, the personal emblem of Charles V, and his motto 'Plus Ultra', which decorate the inside of the fall-front lid (figure 2). Although the cabinet is sufficiently large to house several drawers and compartments, furniture pieces of this kind were crafted more as objects of luxury and ostentation rather than for practical purposes (Aguiló 2009: 20). Fig. 2: Inside of the fall-front lid. © Victoria and Albert Museum, London. The cabinet is believed to have been offered to the emperor as a present during his stay in Mantua in 1532 as suggested, among other elements, by the two putti holding up a tablet inscribed 'D.M.' (Domus Mantuae) (Thorpe 1951: 26; Victoria and Albert Museum 2010). Indeed, such a sumptuous gift can only be explained within the context preceding the cabinet itself. In 1531 Charles V had bestowed upon Ferrante Gonzaga (1507-1537) the order of the Golden Fleece (Thorpe 1951: 26). One year earlier on his 30th birthday, the 24th of February 1530, Charles V was crowned Romanorum Imperator, becoming Monarcha Orbis or Universal Sovereign (Bosbach 2001: 363; König 2001: 590). Charles V's coronation marked the height of his conquest to rule Europe following his victory in Pavia (1525) and the Sack of Rome (1527) and after his coronation, the victory in Tunisia (1535). In just a few years Charles V had gained unprecedented power and works of art became an essential medium for glorifying his image. The outer side of the fall front is divided into three scenes relating to the story of Gideon as told in the Book of Judges. It has been suggested that the scenes were inspired in the imperial ideology of Charles V's reign in which ancient heroes and figures were venerated and reflected the image of the good Christian prince espoused by Erasmus in his treatise to the emperor himself (Checa 1999: 195-196). As Thorpe pointed out (1951: 24-28), the figure of Gideon was chosen for his strong military character. The first scene on the left-hand panel of the cabinet depicts Gideon invoking God for victory of Israel over the Midianites when an angel appeared before him (Judges 6:12) (figure 3). In 1526, Gattinara, Charles V´s chancellor, held that the emperor's primary task was to secure peace in Christendom and urged him to create a universal monarchy (Luttenberger 2001: 43), thus imprinting his imperial ideology with a messianic purpose (Checa 1999: 77; Bosbach 2001: 365). Just as Gideon was chosen by God to secure the safety of Israel, Charles V was appointed successor to the Davidic dynasty by the Israelite judge. This association between the emperor and David and Solomon is also illustrated in the iconographic motifs that decorate the transept of the cathedral of Cordoba, Spain, specifically the vault of the main chapel built during the reign of Charles V and Philip II between 1562 and 1571. As Moreno (2007: 132) states in his study of the cathedral transept, Charles V, like Solomon, exercises justice; a theme that is reflected on the right-hand side of the cabinet by the mythical figure of Astraea, the personification of justice. Like the Hebrew king who led Israel, the people chosen by Yahweh to establish the messianic kingdom on Earth where justice would reign and all nations would subject their will (Isaiah 49:23), Charles V as Gideon would fight to bring justice to his territories. While the scenes that decorate the Plus Oultra cabinet evoke two of the emperor's most outstanding personal traits, his strength and the fact that he is the chosen one (Judges 6:14), they also illustrate the story of the woollen fleece. According to Thorpe (1951: 24), the fleece hung on the branch of a tree suggests that the cabinet was inspired by both the Greek story of Jason and the Argonauts and the biblical story of Gideon. The decoration refers to the Order of the Golden Fleece as well as the authority of the House of Burgundy, and hence its master Charles V (Checa 1999: 64 and ff.) who revived the institution for its knightly pageantry rooted in medieval traditions; traditions which were much to the liking of the emperor as they were the ideal means of enhancing his knight-prince image. Indeed, the figure of the gesturing angel is a reminder to Charles V of his duty as warrior in the service of the order. 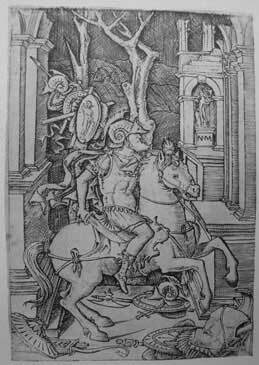 This vision of Charles V as warrior-soldier was particularly prevalent in Italian circles and reflects the virtus or virtues of ancient heroes (Checa 1999: 64 and ff.). 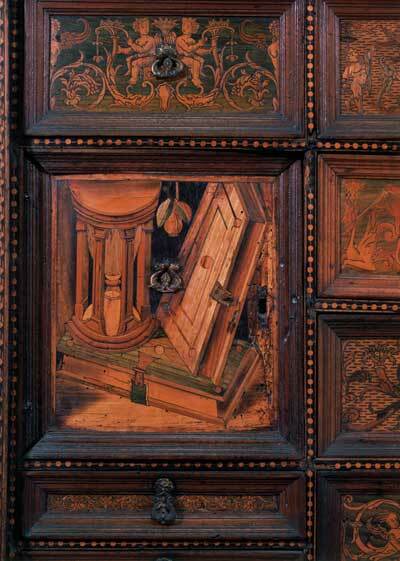 Two different moments of the same scene are depicted on the cabinet: the revelation of the angel to Gideon and a sacrifice offered in the form of bread and the fleece. The story, however, is given a different rendering here. Gideon asks God for proof that he is the chosen one to rescue Israel, and not satisfied, asks for further proof (Judges 7: 36-37 and 39-40). 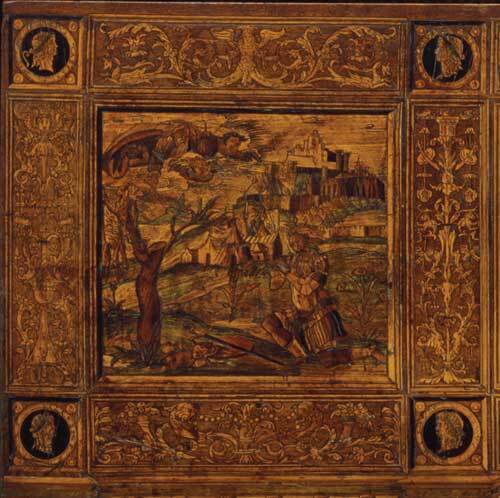 The fleece is central to both accounts, but unlike previous craftsmen who had depicted the fleece laid on the ground, the craftsman of the Plus Oultra cabinet shows it being hung on the branch of a tree in keeping with the imperial ideology of the Order of the Golden Fleece rather than the biblical story. The scene on the central panel of the cabinet depicts the armed force of three hundred men chosen to go to battle (Judges 7: 4-7) (figure 4). It shows how God makes use of the chosen ones to carry out his plans, and how He once again asks Gideon to show that victory over the Midianites was a matter of divine intervention and not due to the Midianites being outnumbered. Fig. 4: Gideon's 300 Chosen Men. © Victoria and Albert Museum, London. From the viewpoint of the recipient of this piece of artwork, Charles V, this scene can be interpreted as God placing his trust in the good ruler to recruit those who will help him in his endeavour, which is to battle those who question divine law. This scene and the one appearing to the right of the battle itself were fundamental in transmitting a message to those who visited the emperor and viewed the cabinet in his chambers: Charles V as Gideon, soldier of God. The emperor's staunch defence of Catholicism (in conjunction with the pope despite the Sack of Rome) in opposition to the Reformists and the Turkish incursion into Europe explains the choice of figures and scenes. In short, Charles V-Gideon depicted himself before his guests and attendants as the protector of the Church of Rome, the unifying force of Christianity and its defender against the Turkish threat and as one shepherd and one flock: ut fiat unum ovile et unus pastor (John 10:16) (Bosbach 2001: 366). This theme is further reinforced in the scene of Gideon the leader selecting his fighters to go to battle. This scene represents the image of Charles V as keeper of peace; an image espoused by the Flemish and Spanish circles whose members were influenced by Erasmus (Checa 1999: 77-78) and proponents of Charles V's messianic image. In contrast, the last scene on the far right depicting the battle between the Israelites led by Gideon and the Midianites seeks its inspiration in Italian humanism, which venerated victory through warfare (figure 5). Fig. 5: Gideon's battle with the Midianites. © Victoria and Albert Museum, London. The three previous scenes telling the story of Gideon are emblazoned with eight medallion busts of Roman emperors, all of whom have been identified from the accompanying inscriptions preceded by the Latin word 'DIVUS'. The top row reads 'IULIUS CAESAR', 'AUGUSTUS' (rubbed out), 'CALIGULA', 'TIBERIUS', while the lower row reads 'CLAUDIUS', 'NERO', 'TITUS', 'DOMITIANUS', clearly suggesting that the purpose of the decoration was to reinforce the image of the Catholic emperor as successor to the Ancient Roman Empire and scion of Charlemagne himself, legitimise his power and ennoble him with divine grace. In turn, the military figure of Gideon indicates God's need for soldiers on Earth to extend his power throughout the world. This all'antica iconography, which links the image of the emperor to that of the most prestigious Roman leaders and of a military and religious hero at one and the same time, strengthens Charles V´s figure and consolidates his image as a 'classic mythical hero'. This theme takes on particular relevance following Charles V's triumph over Tunisia in 1535 and his subsequent visit to several Italian cities (Checa 1981: 238-239). The depiction of the Roman Caesars served to confirm the virtues extolled by the emperor's poets, namely the renewal of the ancient grandeur of the Roman Empire under Charles V's reign. As Checa maintains (1981: 240), the association between the emperor and mythological or historical figures of the classic tradition was the ideal way to promote the emperor's image and evoke one of the political attributes most exalted by authors such as Machiavelli and Guicciardini: dissimulation, that is, appearing to have all the virtues even when just the opposite is true. Yet the figure of Charles V can be interpreted further: he is not only legitimate heir to the Roman emperors, but attempts to revitalise the Ancient Empire as Dante expounds in Monarchy, where the monarch, God´s will providing, must procure world peace; a peace that can only be achieved through a monarchy or an empire ruled by one man (Moreno 2007: 80). Appearing below the three scenes depicting the story of Gideon on the fall front are three landscapes as if viewed through a palace balustrade. 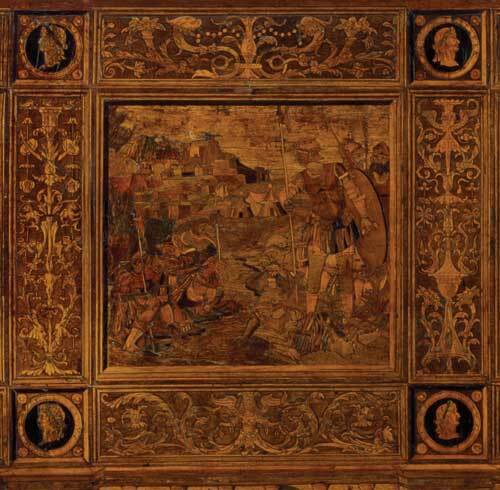 Although none of the landscapes have been identified and their inclusion in the cabinet has yet to be explained, it is important to note that a large number of lavish furnishings decorated with intarsia work were crafted in Italy such as Federico de Montefeltro's studiolos, or cabinet rooms, in the ducal palaces at Urbino (1472-1476) and Gubbio (1474-1476) and that of Isabella d´Este, as well as choir stalls and wall panelling. The landscapes that appear in the studiolo of the Duke of Urbino may serve to shed some light on the Plus Oultra cabinet. Devised as an invitation to a contemplative life, these studiolos were decorated with representations of rivers and lakes to evoke the locus amoenus or pleasant place that Alberti recommended for domestic furnishings due to their therapeutic and restorative properties (Cheles 1982: 23). In the same manner, when opened, the cabinet would inspire a sense of peacefulness in its owner in a play between earthly vanities and erotes in a fantasy world replete with dragons and other beasts. Like the studiolos, the outer side of the cabinet lid is decorated with Renaissance motifs such as the candelieri, or candelabra, beastly beings, and angels bearing palms symbolising the triumph of the spirit. This display of virtuosity finds a parallel expression in the choir stalls of the Church of San Pietro in Perugia, the work of Fra Damiano da Bergamo and his brother Stefano Zambelli dating 1533-1536, and those of the Collegio del Cambio in the same town crafted by the Florentine artist Antonio Bentivegna da Mercatello in the first decade of the 16th century (Flade 1986: 61, pl. 50-52). The leaves, delicate scrolls and beastly figures which decorate these two impressive works bear the closest resemblance to the candelieri and grotesque themes adorning the Plus Oultra cabinet. 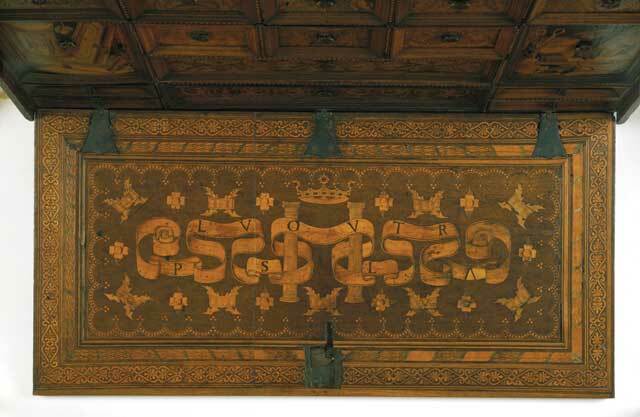 The inside of the fall-front lid is decorated with the inlaid 'Pillars of Hercules' emblem of Charles V, the crown and a wavy ribbon with the inscription 'PLUS OULTRA', all of which are surrounded by St. Andrew's crosses and adornments alluding to the standard of Burgundy (figure 2). A direct allusion to the emperor, these decorations leave no doubt as to the ownership of this piece of furniture. As stated above, Charles V deemed himself heir to the most celebrated Roman emperors. However, given that he does not portray himself as a Roman emperor and does not appear with his head crowned by laurel – in allusion to eternity – the cabinet is decorated with a laurel border symbolising his privileged position as Roman princeps. In this same manner, Alciato's CCX Laurus emblem (Sebastián 1993) referred to Charles V as being worthy of Apollo's laurel crown due to his victory over the Carthaginians. When opened, the inside of the fall front served as propaganda for the emperor (figure 6). Its architectural and allegorical elements glorified him, while the virtues represented on either side of the cabinet, the Ancient heroes – in this case personified by Gideon – and the deified Caesars were a means for supreme exaltation. In fact, this symbolic image of the emperor as Caesar had been established during his reign and was disseminated through engravings which were the basis for this particular iconography (Wohlfeil 2001: 330); motifs that were the inspiration for many other works of art such as paintings, miniatures and sculptures, among others. Fig. 6: Inside of the cabinet. © Victoria and Albert Museum, London. The Plus Ultra motto was devised as a reminder that the Spanish empire stretched far beyond the Pillars of Hercules. It was used to depict Charles V as the leader of a worldwide empire where Christianity must be extended to ensure peace and order (König 2001: 595 and ff.). The cardinal virtues, in this case Justice and Temperance, are allusions to the qualities an emperor must possess (figures 7 and 8). Indeed, these and other virtues are associated to the figure of Charles V in numerous artistic works. Educated to uphold knightly values, one of Charles V's favourite readings was The Resolute Knight by Olivier de la Marche, where the prince was distinguished not only for his wisdom but also for his virtues; traits that were very much in fashion in the Italian courts at that time (Checa 1999: 20-21). The influence of Erasmus in the education of Charles V should not be overlooked either. In 1516, Erasmus wrote Education of a Christian Prince, a sort of instruction manual for the then young prince emphasising the virtues and moral principles of a governor who should ensure peace and justice above all (Yates 1975: 19-20). 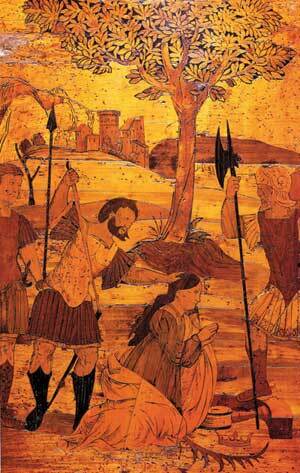 In that same year, at the Court of Ferrara near Mantua, Ariosto's Orlando Furioso was published. This romantic epic recovers the notion of an empire through the figure of Charlemagne to glorify Charles V (Checa 1999: 367). When Ariosto learned of the prophecy of Charles V's future empire, he envisaged a world under a universal monarchy in which the emperor 'should the imperial garland bear, Augustus', Trajan's, Mark's, Severus', crown', while in war for courage and in peace for justice (Canto 15, 16). The epic poem goes on to state that Astraea (Justice), like the virtues, will be re-enthroned after its long exile (Canto 15, 18) (Harington 1972: 166). Orlando Furioso seems to have been highly valued by those who devised the iconographic programme of the cabinet: Charles V-Gideon brings justice to his people by confronting the enemy and ruling with temperance according to God's plan. In short, it is the sacred messianism revealed through the Dominus Mundi or Charles V who will impose universal order under the Christian monarchy (Moreno 2007: 154-155). Fig. 7: Justice (photo by the author). Fig. 8: Temperance (photo by the author). Parallelisms for the virtues represented on the cabinet can be found in traditional iconography. The cabinet depicts several iconographic elements typical of early Renaissance engravings and drawings, particularly those of the circle of Botticelli, who supplied sketches to the master wood inlayers in the last quarter of the 15th century until his death in 1510, while certain analogies can also be found in Nicoletto da Modena's engravings (figures 9-11). Although exact parallelisms for the motifs cannot be found among Nicoletto's works, the style of the cabinet is similar to this artist's work, particularly the allegorical engravings (figure 11) and a Roman soldier on horseback (figure 10) that recall the Israelites under the command of Gideon. The scenes on the cabinet, however, differ from Nicoletto's work in that they do not depict the Roman ruins of which the artist was so fond. Nonetheless, there are sufficient elements to suggest that the cabinet was inspired by Nicoletto's engravings, whose virtues and allegorical figures are similar to those of Botticelli's circle, as well as the landscape of tree trunks with branches devoid of leaves. Moreover, the breastplate and skirt, the helmet decorated with scrolls, and the details of the boots worn by the Roman rider (figure 10) appearing in Nicoletto's engraving are similar to the apparel of Gideon and his comrades. It is also interesting to note the formal similarities between Nicoletto's rearing horse and the horse that appears in the battle between the three hundred men and the Midianites. 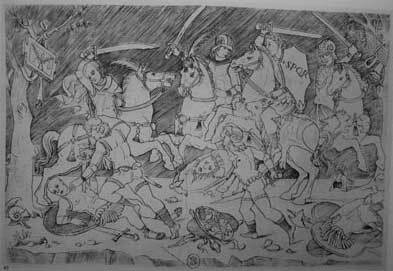 Finally, the disorderly grouping of soldiers and cavalrymen are reminiscent of Nicoletto's engraving of a battle scene (figure 9). Fig. 9: Battle. Nicoletto da Modena (British Museum 1909). Fig. 10: Cavalryman. Nicoletto da Modena (British Museum 1909). Fig. 11: Victory. Nicoletto da Modena (British Museum 1909). Returning to the front of the cabinet, the fall front opens to reveal a set of drawers and two small doors that were used to safeguard personal belongings. The doors are adorned with still lifes (figures 12 and 13): an hourglass, the scissors, the books, the fountain pen and the inkpot. They are simply fitting items for a writing cabinet. Fig. 12: Still life with scissors (photo by the author). These still life motifs, which were widely used in different settings and on furnishings such as cabinets, studiolos, dressing rooms, choir stalls or chapels, served as reminders that all human action is transient. The books and notes strewn carelessly on the shelves, the pen sitting in the inkpot, the open tobacco jar, the scissors ready to cut, the fresh fruit, and the sand trickling down the hourglass all give the impression that the owner will soon return, while the use of foreshortened marquetry creates the illusion that the viewer is looking at the objects themselves. These objects served as an invitation to a cultured and contemplative life in contrast to Gideon's heroic deeds, which called for action. The choice to include decorative elements on the cabinet depicting both an active and a contemplative life cannot be simply the result of chance, but must have been intentionally designed to invite the cabinet's owner to meditation and study or, on the contrary, to act bravely in the face of battle. While the themes represented on the cabinet are in themselves of extraordinary interest, the intarsia decoration is especially noteworthy. Sumptuous examples of such work, some of which have already been mentioned, can be found throughout Italy, particularly in the north. Among the most famous examples are the choir stalls, libraries and studiolos in palaces at Verona, Urbino and Gubbio renowned for their elaborate intarsia panelling. However, these are not the only ones; a series of earlier and subsequent works rival them in magnificence. One of the most outstanding examples is the previously cited studiolo of Isabella d'Este in the Ducal Palace at Mantua, which is decorated with wood inlay books and musical instruments in allusion to the ideal of the educated wife. 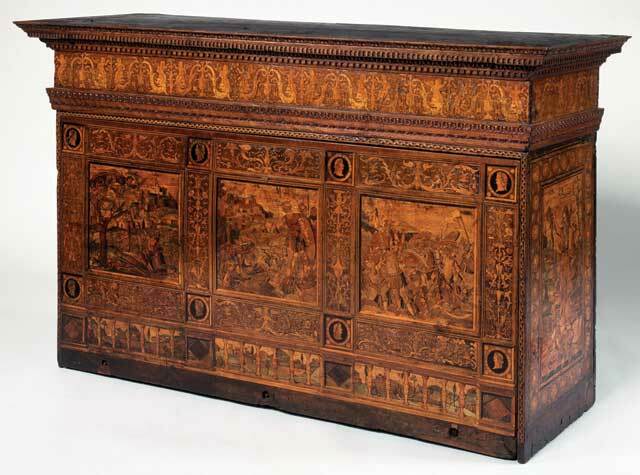 Although one might be tempted to think that the same craftsmen who worked on the studiolo – Paolo and Antonio Mola (Brown 2005: 39) – also made Charles V's cabinet (given that the cabinet was a gift from the House of Mantua), the evidence suggests otherwise. Nevertheless, it should be noted that the still lifes with questionable perspective that decorate the cabinet show certain similarities to the still lifes of both brothers (e.g. in the sacristy of San Marco in Venice and the Palazzo Ducale in Mantova). Following a detailed study of numerous examples, we find that the Monte Oliveto Maggiore choir stall by Fra Giovanni da Verona, which is decorated with vanitas, urban landscapes and saints, also shares a specific motif with the cabinet (Brizzi 1989), hazelnuts. The hazelnut motif appears in the still lifes decorating both the cabinet and the Monte Oliveto Maggiore choir stall in an allusion to patience and perseverance (Brizzi 1989: 132). The two furnishings also have other common decorative elements: the hourglass, open spaces with candelieri and grotesque motifs as well as the wood stained green by fungal infestation (chlorociboria) (Aguiló 2009: 25; Wilmering 1999: 131). Despite these similarities, certain elements distinguish the two. However, Fra Giovanni had many disciples such as Fra Raffaele da Brescia and Fra Antonio da Venezia or others such as Fra Matteo da Trento and Fra Vincenzo Dalle Vacche, all of whom were active craftsmen belonging to the religious orders in the late 15th and early 16th century. It is also known that Fra Giovanni made his own drawings which were then used to craft his works (Wilmering 1999: 123-125). Given that the cabinet is dated ca. 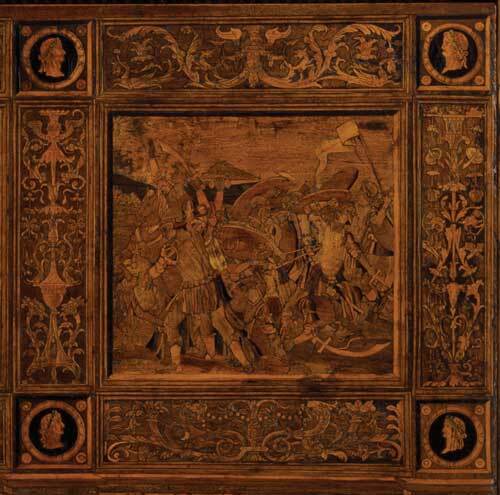 1532 coinciding with Charles V's visit to Mantua, it is possible that the craftsman who designed the emperor's cabinet formed part of Fra Giovanni's circle. Moreover, it is interesting to note that Fra Giovanni was no stranger to Mantua as he had travelled there between 1493 and 1502 to select and purchase the wood needed to build the choir stalls of the Santa Maria in Organo Church in Verona (Wilmering 1999: 4); a journey that perhaps some of his young apprentices accompanied him on. It would therefore seem logical to think that the scenes from the story of Gideon were very much in keeping with these artist monks who were familiar with such biblical accounts, especially Fra Damiano da Bergamo, who was born Francesco Zambelli (ca.1480-1549) and trained under the intarsia master Fra Sebastiano da Rovigno at the monastery of Santa Elena in Venice. This Dominican friar and his workshop, where his brother also worked (1533-1545), specialised in stories of the Old and New Testament and trained numerous master craftsmen. However, the scenes on the cabinet are a far throw away from the complex architecture and perspectives of which Fra Damiano was so fond, as the main works of the artist cited below demonstrate. Could the cabinet be an early work? This hypothesis cannot be ruled out as the choir stalls of Saint Domenico in Bologna, his masterpiece, were finished two years after his death (Wilmering 1999: 131). Nor should we overlook the grotesques and candelieri adorning the cabinet, which share many elements in common with those found at Saint Peter's Church of Perugia, which were crafted by Fra Damiano from 1533 to 1536. In addition, the cabinet is inlaid with floor motifs which appear under the feet of both allegorical figures of the virtues; motifs that Fra Damiano used widely in the choir stalls of San Bartolomeo da Bergamo. Both pieces, the choir at Bergamo and the cabinet, are also decorated with similar figures of Roman soldiers, specifically in the scene representing the martyrdom of Saint Catherine of Alexandria (figure 14). Although the exact dates when Fra Damiano worked in San Bartolomeo are not known, it is believed that he crafted the choir stalls in the second decade of the 16th century. The Venetian Marcantonio Michiel, who travelled to Bergamo in 1525, was the first to speak of the choir of San Estefano and the painters that provided Fra Damiano with the sketches to make the choir: the artists Tonzo di Monza, Bernardino Zenale and Bartolomeo Suardi detto il Bramantino (Polli 1995: 31). Fig. 14: The martyrdom of Saint Catherine of Alexandria. Fra Damiano da Bergamo (Wilmering 1999: 127). Craftsmen from Fra Damiano's workshop may also have helped him to craft the cabinet as the scenes representing Gideon bear a distant resemblance to those he carved for San Domenico (Wilmering 1999: 127). Certain analogies can also be found in the soldiers on horseback that appear in an intarsia panel representing the Crucifixion inscribed with the year 1542 (figure 15). Fig. 15: Crucifixion. Fra Damiano da Bergamo (Wilmering 1999: 129). Moreover, Charles V visited Fra Damiano in person at his workshop in San Domenico on December 5th 1529 while in Bologna for his coronation, which was to take place about a month later (Wilmering 1999: 129). By that time, the Dominican friar had gained enormous prestige, and it is said that the emperor was astonished to see the choir panels, not believing they were inlaid work rather than paintings (Polli 1995: 131). Although the identity of the author of the Plus Oultra cabinet has not been documented, the evidence leaves no doubt as to the artistic and cultural circle in which it was crafted. This is further supported by the fact that Fra Damiano was active in 1532, the same year in which Charles V's cabinet has been dated. This suggests that the Dominican friar, with the aid of the craftsmen from his workshop, might be the author of the piece; especially the scenes of Gideon, which are of greater technical and compositional complexity, while the still lifes are more in keeping with the work of the Mola brothers. As Rosenthal has argued (1971: 226, n. 93), different artists of the time may have produced the parts separately, or the pieces may have been crafted at different times and later assembled to make the cabinet. This extraordinary piece on display at the Victoria and Albert Museum is an example of the excellent quality of the intarsia work being done in Italy from the late 15th century to the early 16th century, and is a paradigm of the concerns of the Renaissance man, whose intellectual, moral and military aspirations are transmitted through a seemingly inextricable iconology that makes use of symbolic language and personified motifs to unite the Christian world and pagan allegories. It is a cryptic language immersed in the Renaissance style to gain pleasure through knowledge. Undoubtedly, the cabinet's iconographic programme required the aid and advice of the circle of humanists surrounding Charles V, which made use of official images to glorify the power of the emperor of the Romans as Dominus Mundi, whose extensive dominions justified adopting and exalting the Plus Ultra motto. 1 This paper has been possible thanks to a grant from the University of Cordoba for a research stay at the University College London during the summer of 2010. The author is grateful to Mariam Rosser-Owen and Nick Humphrey from the Victoria and Albert Museum for their help, advice and reviews. This work would not have been possible without the permission of the Warburg Institute to consult its library and photographic collection. 2 The cabinet was purchased in 1891 from collector Stephano Bardini. Its dimensions are: Height: 81.3 cm, Width: 134 cm, Depth 44.4 cm (Victoria and Albert Museum 2010). 3 Further references to the cabinet include Tipping (1917), the catalogue card in Wilk (1996: 36-37), Bode (1902: 66) and Schottmüller (1921: xxv, 116). 4 Although Charles V was also in Mantua in April 1530, his visit was short compared to his stay two years later (Fernández 1973: 204-207). In reality, Charles' V motto is Plus Ultra, but appears on the cabinet as Plus Oultra. 5 Given the close diplomatic relations between Spain and the princely courts of Italy, such a lavish gift was not unusual. 6 Themes relating to Gideon formed an essential part of Charles V´s imperial iconography and were depicted not only on the cabinet, but also on triumphal arches, other types of furnishings and tapestries. The inventory drawn up in Brussels in 1536 mentions a collection of tapestries including several that tell the story of Gideon (Checa 1999: 187). 7 As we will see below, Ariosto established the image of governor as Good Shepherd in Orlando Furioso. 8 For more on the Roman image of the emperor see Checa 1999: 196 and ff. 9 For more on the notion of Charles V as renewer of the Roman Empire and his legitimacy to rule over the Universitas Christiana represented by the medallion heads of Uomini famosi see Moreno 2007: 80-84. 10 The court poets strived to depict Carlos V as the new Augustus using as their inspiration the classic texts (Römer 1999: 343-358). Moreover, Charles V's inventories listed the imperial cape which displayed the figure of Charlemagne between the Pillars of Hercules. Cf. Checa et al. 2010. 11 Checa (1999: 82-84) analyses images of the emperor depicted beside Solomon and David, which served to equate Solomon's wisdom and David's clemency with the virtues of Charles V. On the occasion of Charles V's triumphal entry into Arras in 1548, one of the triumphal arches was decorated with scenes of the life of Gideon, David, Solomon, and the Queen of Sheba. For his triumphal entry into Tournai in the same year, an arch depicted parallel stories of the biblical and mythological heroes Hercules/Samson, Gideon/Jason in clear allusion to Charles V.
12 Not only the poets, but also Pedro Ruiz de la Mata Bishop of Badajoz, who sympathised with the emperor, delivered a speech on March 31, 1520 before the courts to justify Charles V´s trip to Aachen for his coronation as emperor only two years after his arrival in Spain. In the words of the prelate, his journey recovered the country's glorious past when Hispania gave great emperors to Rome such as Trajan, Adriano and Theodosius (see König 2001: 594). 13 Made in 1476, the Urbino studiolo is thought to have been designed by Bramante, Botticelli, or Francesco di Giorgio Martini and built by Baccio Pontelli (Cheles 1982: 1). 14 The Gubbio studiolo was acquired by the Metropolitan Museum of New York in 1996 and restored to its original state using photogrammetric techniques. 15 Examples can be found in the cathedrals of Perugia, the north sacristy of the Cathedral of Florence, Santa Maria Novella Church, the Cathedral of Lodi in Pisa, the Basilica of San Domenico in Bologna, the Collegiate Church of San Quirico d´Orcia, the Basilica of Santa María Maggiore in Bergamo, the Palazzo Pubblico of Siena, Santa Maria in Organo Church in Verona, San Petronio Church in Bologna, the Church of St. John the Evangelist in Parma and the Cathedral of Todi. 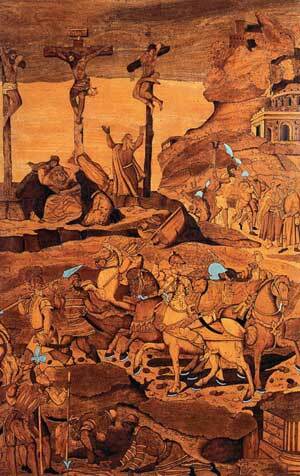 The list of master wood inlayers is extensive. 16 This is neither the imperial nor the royal crown. While it resembles a marquis crown, this and other details analysed by Rosenthal in his article on the motto (1971: 226-227) could be due to the artist's license; a common practice in heraldic representations. 17 Motto/device created in 1516 by Luigi Marliano during the first chapter of the order held in Brussels, which Charles V attended. For more on how the device was created see Checa 1999: 61 and ff. 18 The cross of St. Andrew - patron of Burgundy - appears numerous times as a heraldic motif associated with the imperial coat of arms. Examples include two miniatures dating ca. 1530 in the Breviarium Caroli Imperatoris at the Real Monasterio del Escorial Library which portray Charles V as one of the Wise Men and another with his portrait, as well as in a standard with Saint James the Moor Slayer in the Inventario iluminado (1544-1589) at the Real Armoury of Madrid. Later, in 1591, Paradin depicted this and the other emblems appearing on the cabinet in his work (1984: 52-53 and 32-34, 49-51). The cross of St. Andrew therefore adorns the cabinet for its heraldic value and not to commemorate St. Andrew´s day and the feast day that was held in Mantua during Charles V's visit as Wilk claims (1996: 36). 19 The two pillars draped with a wavy ribbon had already appeared on the reverse side of the ¼ escudo coin minted in 1549 although previous representations may have existed. The imperial crown, however, first appeared on coins in 1548 (Cascione 2006: 122 and 124). 20 When the emperor made his triumphal entry into Bologna on November 5, 1529 – just a few years before the cabinet is believed to have been made – the procession marched through several triumphal arches decorated with mythological scenes, several effigies of emperors and important Roman figures of Antiquity, as well as Charlemagne, the emperors Constantine and Sigismund and Ferdinand the Catholic (Domínguez 2000: 28). 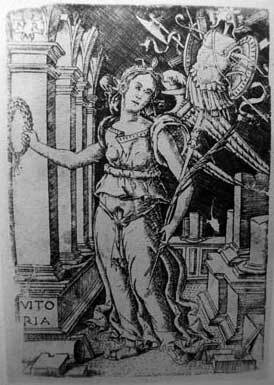 21 Such as the copper engraving made by Enea Vico in 1550 (National Library, Madrid). 22 Canto 15º, 15-16 and 18. 23 Some of the emperors are also depicted on the cabinet. 24 It has been suggested that the figure of Justice depicted on the left side of the cabinet was added during restoration work carried out in the 19th century (Rosenthal 1971: 226, n. 93). 25 Nicoletto da Modena produced a great number of drawings, something that Vasari praised when he stated: "Sandro draws much more than normal" (Hind 1938-1948: 89). 26 Compare, for example, the female virtues on the cabinet to Nicolas da Modena's engraving of the Victory. Similarities can be found between their attire, the pleats of their robes, physical features, headdresses, and sandals (Bartsch 1984: 25,173; Hind 1909: s.p., fig. 19; Lambert 1999: 283; Levenson et al. 1973: 466 and 473). 27 In the Gubbio and Urbino studiolos, a round box appears with the lid ajar revealing candied fruits inside. 28 This principle governed the Urbino studiolo (see Cheles 1982: 3). 29 Examples of themes related to those appearing on the cabinet can be found in the intarsia work at the Ducal Palace of Urbino (ca. 1476), the panels of the choir stalls in the Chapel of St. John the Baptist in the Cathedral of Siena made by Antonio di Neri Barili from 1488 to 1502 and the choir stalls of the Palazzo Pubblico of Siena. Examples of similar vanitas motifs can be found in the choir stalls of Santa María in Organo Church in Verona made by Fra Giovanni da Verona from 1493-1499, or the vanitas and urban landscapes of the Church of San Petronio in Bolonia by Raffaelo de Brescia in 1521. 30 Isabella d'Este was married in 1490. Her son Federico II (1500-1540) transformed Mantua into a second Rome, while her son Ferrante (1507-1557) became counsellor to Charles V.
31 There were previous biblical stories of this type: in the tympanum of Orvieto, in the Palazzo Pubblico of Siena and in the Cathedral of Florence, where the prestigious Giuliano da Maiano did intarsia work (Wilmering 1999: 127). 32 A replica is on display at the Davia Bargellini Museum of Bologna. 33 The scenes share several elements in common. Some of them are depicted with great skill such as the 'David striking down the Philistines' (Samuel 8:1), which portrays soldiers clad as Romans on horseback. Like the cabinet, this scene is very confusing. Others include the Eleazar episode (Macc 6: 43-46), the tents and architectural elements in the background of 'The Philistines Fleeing before David' with the hero in the foreground slaying Goliath or 'Moses bringing forth water from the rock at Horeb', which is similar in composition to the scene of Gideon selecting the three hundred men. 34 'Frater Damianus de Bergomo homo pertissimus singularissimus et unicus in l'arte della tarxia conversus, receptatus fuit in filium conventus 1528.' Fra Lodovico da Prelormo's Chronicle (Wilmering 1999: 129). Aguiló Alonso, M P 2009 En busca de la sabiduría. Un programa iconográfico en un mueble alemán de marquetería del siglo XVI. Boletín del Museo de Bellas Artes de Bilbao 5, 15-63. Allo Manero, A 2000 Exequias del emperador Carlos V en la Monarquía Hispana. In: Zamala Rodríguez, M A and Redondo Cantera, M J (eds.) Carlos V y las Artes: promoción artística y familia imperial. Valladolid: Junta de Castilla y León, Universidad de Valladolid, 261-282. Bartsch, A V 1984 The Illustrated Bartsch. New York: Abaris Books. Bode, W 1902 Die italiensichen Hausmöbel der renaissance. Leipzig: Hermann Seemannachfolger. Bosbach, F 2001 Concepción imperial e imagen pública de Carlos V en su coronación en Bolonia. In: Kholer, A (ed.) Carlos V/Karl V. 1500-2000. Madrid: Sociedad Estatal para la Conmemoración de los Centenarios de Felipe II y Carlos V, 370-374. British Museum 1909 Illustrations to the catalogue of early Italian engravings preserved in the department of prints and drawings in the British Museum. London: British Museum. Brizzi, G 1989 Il coro intarsiato del Abbazia di Monte Oliveto Maggiore. Milán: Amilcare Pizzi. Brown, C M 2005 Isabella d´Este in the Ducal Palace in Mantua. Roma: Bulzoni. Cascione, G 2006 Iconocrazia, Comunicazione e politica nell´Europa di Carlo V. Dipinti, emblemi e monete. Milán: Ennerre. Checa Cremades, F 1981 Artificio y lenguaje clasicista en la Florencia Medicea. Cuadernos de trabajos de la Escuela Española de Historia y Arqueología en Roma 15, 229-240. Checa Cremades, F 1999 Carlos V. La imagen del poder en el Renacimiento, Madrid: El Viso. Checa Cremades, F, Edelmayer, F, Eichberger, D, Hein, J, Jordan Gschwend, A, Redondo Cantera, M J, Van den Boogert, B C and Zalama Rodríguez, M Á 2010 Los inventarios de Carlos V y la familia imperial, vol.1: Carlos V. Madrid: Fernando Villaverde. Cheles, L 1982 The Inlaid Decorations of Federico da Montefeltro´s Urbino Studiolo: An iconographic study. Mitteilungen des Kunsthistorischen Institutes in Florenz XXVI, 1, 1-46, http://www.jstor.org/stable/27652541. Domínguez Casas, R 2000 Fiesta y ceremonial borgoñón en la corte de Carlos V. In: Redondo Cantera, M J and Zalama, M A (eds.) Carlos V y las Artes. Promoción artística y familia imperial. Valladolid: Junta de Castilla y León, Universidad de Valladolid, 14-17. Fernández Álvarez, M 1973 Corpus documental de Carlos V. Salamanca: Universidad. Flade, H 1986 Intarsia Europäische Einlegekunst aus sechs Jahrhunderten. Munich: Verlag C. H. Beck. Harington, H 1972 Ludovico Ariosto´s Orlando Furioso. Oxford: Oxford University Press. Hind, A M 1909, 1910 Catalogue of Early Italian Engravings Preserved in the Department of Prints and Drawings in the British Museum [Illustrations]. London: William Clowes and Sons. Hind, A M 1938-1948 Early Italian Engravings: A Critical Catalogue with Complete Reproduction of all the Prints Described. London: Knoedler, M. & Co.
König, H J 2001 Plus Ultra: ¿Emblema de conquista e imperio universal? América y Europa en el pensamiento político de la España de Carlos V. In: Kholer, A (ed.) Carlos V/Karl V. 1500-2000. Madrid: Sociedad Estatal para la Conmemoración de los Centenarios de Felipe II y Carlos V, 577-599. Lambert, G 1999 Les premieres gravures italiennes. Paris: Bibliothéque Nationale de France. Levenson, J A, Oberhuber, K and Sheehan, J L 1973 Early Italian Engravings from the National Gallery of Art. Washington D.C.: National Gallery of Art. Luttenberger, A P 2001 La política religiosa de Carlos V en el Sacro Imperio Romano. In: Kholer, A (ed.) Carlos V/Karl V. 1500-2000. Madrid: Sociedad Estatal para la Conmemoración de los Centenarios de Felipe II y Carlos V, 43-90. Moreno Cuadro, F 2007 El crucero de la catedral de Córdoba. Estudio iconográfico e iconológico. Cuadernos de Arte e Iconografía XVI, 31. Paradin, C 1984 The Heroicall Devises of M. Claudius Paradin (1591). New York. Scholars' Facsimiles & Reprints. Polli, V 1995 Le tarsie di San Bartolomeo in Bergamo del Frate Damiano Zambelli. Bergamo: Ferrari. Römer, R 1999 Panegíricos en la época de Carlos V. In: Kholer, A. (ed.) Carlos V/Karl V. 1500-2000. Madrid: Sociedad Estatal para la Conmemoración de los Centenarios de Felipe II y Carlos V, 343-358. Rosenthal, E 1971 Plus Ultra, Non Plus Ultra and the device of Emperor Charles V, Journal of the Warburg and Courtauld Institute XXXIV, 204-228, http://www.jstor.org/stable/751021. Schottmüller, F 1921 Wohnungskultur und Möbel der Italienischen renaissance. Stuttgart: Hoffman. Sebastián, S (ed.) 1993 Alciato Emblemas, 2nd ed. Madrid: Akal, 251. Thorpe, W A 1951 The Plus Oultra Cabinet at South Kensington. The Connoisseur 128, 24-28. Tipping, H A 1917 Italian Furniture of the Italian Renaissance as Represented at the Victoria and Albert Museum. Country Life, March 31st (supplement), 3-8. Victoria and Albert Museum 2010 Plus Oultra Cabinet, Search the Collections. Available at: http://collections.vam.ac.uk/item/O70502/cabinet-plus-oultra-cabinet/?print=1 [Accesed 23 July 2010]. Wilk, C (ed.) 1996 Western Furniture 1350 to the Present Day: In the Victoria and Albert Museum London. London: Victoria and Albert Museum. 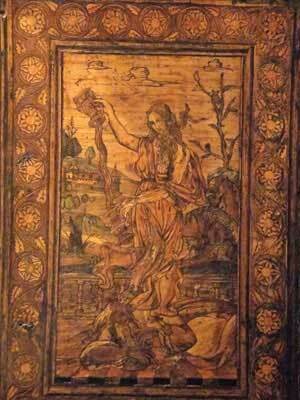 Wilmering, A M 1999 The Gubbio Studiolo and its conservation. Vol. 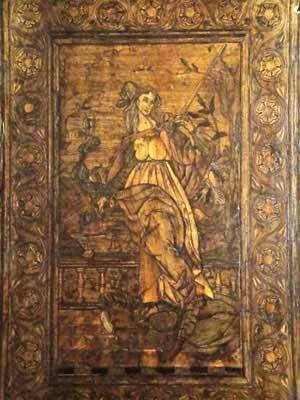 2, Federico da Italian Renaissance Intarsia and the Conservation of the Gubbio Studiolo. New York: The Metropolitan Museum of Art. Wohlfeil, R 2001 Retratos gráficos de Carlos V al servicio de la representación y la propaganda. In: Kholer, A (ed.) Carlos V/Karl V. 1500-2000. Madrid: Sociedad Estatal para la Conmemoración de los Centenarios de Felipe II y Carlos V, 307-332. Yates, F A 1975 Astraea. The Imperial Theme in the Sixteenth Century. London: Routledge & Kegan. Zapata Fernández De La Hoz, T 2000 Aspectos simbólicos de las exequias de Carlos V. In: El mundo de Carlos V. De la España medieval al Siglo de Oro. Madrid: Sociedad estatal para la Commemoración de los Centenarios de Felipe II y Carlos V, 209-228.